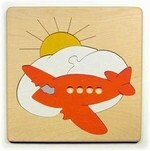 A sturdy white, blue, & black plane backed by a yellow sun & white cloud flies across a sky blue puzzle tray. One-piece jet plane allows for fun imagination play - let the tips of your fingers show in the windows like faces! Simple design for beginng puzzlers. A darling puzzle for the nursery, Sunday school, or any 2-year old that loves animals. 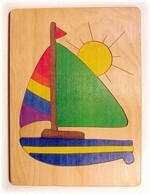 Using all 6 colors of the rainbow, this puzzle helps teach kids size progression, small to large. The puzzle's frame is beautifully hand painted with sky and sea. Cute for train lovers, cute in the nursery! Use the red wheels to play peek-a-boo!If you'd like a few extra pieces for your bright train lover, just let us know. 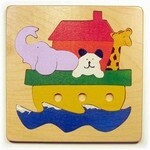 10" x 10" x ½"
This wooden tugboat puzzle makes a cute companion to the kid's story "Little Toot".